When you arrive at Zhangjiajie by morning flight, our tour guide will meet you at the airport holding a sign with your name on it at the arrival terminal. Head to the Tianmenshan Cable Car Station in the downtown. Take a cable car straight to the Tianmen Mountain Scenic Area. The cable car boasts to be the world's longest of its kind, which takes 28 minutes to arrive at the mountain top. You can enjoy the amazing scenery during the ride. 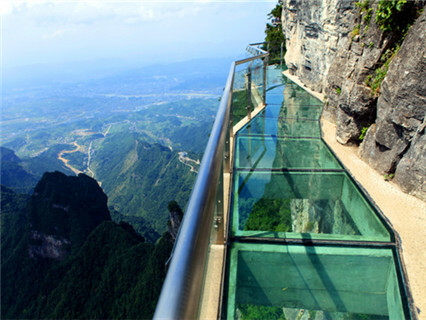 Then experience the breathtaking Glass Skywalk, which spans 60 meters of a 2-km loop encircling the vertical cliffs. Then visit the Tianmen cave, the natural mountain-penetrating karst cave with the highest elevation in the world, hangs on the towering cliff. Then take a shuttle bus or cable car to go down the mountain. Be transferred to your hotel. Pick you up from your hotel lobby in the morning. 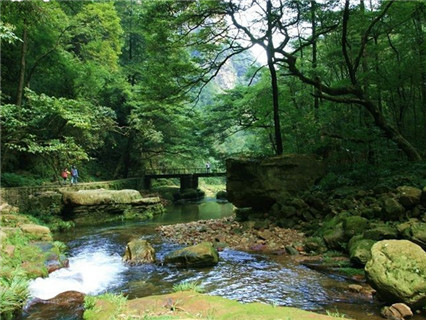 Drive forward to Zhangjiajie National Forest Park. Visit Huangshi (Yellow Lion) Village, which rises 1,080 meters above the sea level. In fact, it is a vast platform, consisting of tremendous steep cliffs, covering an area of 16.5 hectares. 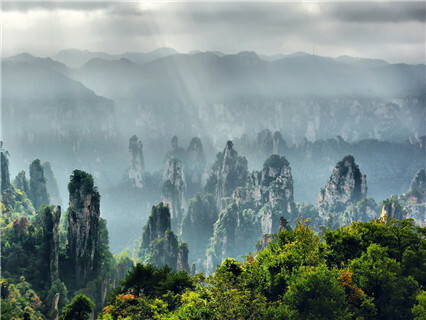 There is a famous saying "He who does not reach the Huangshi Village does not pay a true visit to Zhangjiajie.” Take cable cars to go up and down the village. A trail is also waiting for you to hike about five hours. Then walk along the Golden Whip Brook, which is about 7.5 kilometers (4.7 miles) long and is known for its pristine waters, steep cliffs and green mountains. Back to your hotel after the tour. Pick you up from your hotel lobby and head for Tianzi Mountain Cable Car Station. Take a cable car up to the mountain, and in the meantime you can enjoy the stunning views of the surrounding mountains and valleys. Then walk along the mountain path to enjoy the scenery and the tour guide will give you more information about the attractions. Waterfalls, bridges, stone forests and caves are found throughout the mountains. 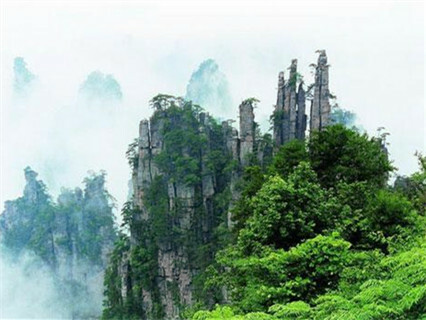 Tianzi Mountain is known for 4 natural spectacles – the clouds of mist that circle the peaks of the mountain, the amazing views of the rising sun, the moonlit nights and snowcapped winter peaks. 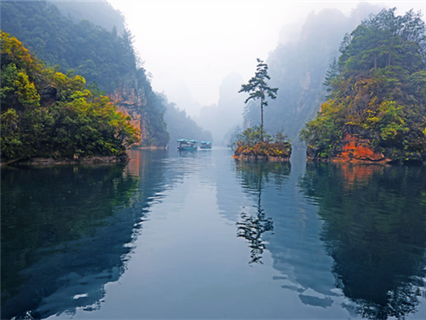 Then take a shuttle bus to Yuanjiajie Scenic Area, the core of Wulingyuan World Heritage, which is a mysterious, magic and primitive place. Here you will see the First Bridge, which is a natural bridge connecting two mountains together. 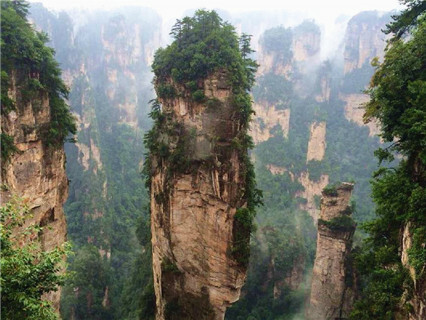 Most of all, you will see the Hallelujah Mountain(Qiankun Column), the prototype of the floating Hallelujah Mountain in the Hollywood blockbuster Avatar. When clouds and mists rise, you may feel like standing in a fairyland. Go down the mountain by Bailong Elevator (Hundred Dragons Elevator). It is claimed to be the highest outdoor elevator with the largest carrying capacity in the world and is recorded in the Guinness Book of World Records. Then take a shuttle bus to the exit and the driver will transfer you to the hotel. Pick you up from your hotel lobby in the morning. Drive to Yellow Dragon Cave(Huanglong Cave). 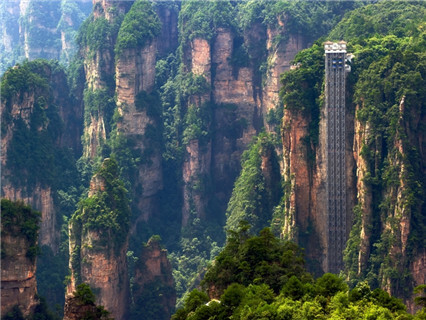 It is 7.5 km long and has a vertical rise of 140 meters. 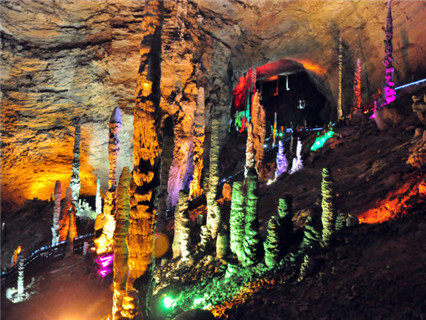 There are six major scenic spots in the cave, including Dragon Dancing Hall, Maze, Sounding River, Immortal Waterfall, and Heaven Pillar Street. It is rare to see thousands of stalagmites and stalactites in the karsts cave like this at home and broad. And geology experts draw the similar conclusion that Yellow Dragon Cave is the all round champion. Then followed by Baofeng Lake, which is the masterpiece of nature and human beings’ wisdom. It is 85 meters above the ground and attains an altitude of 585 meters. With an average depth of 72 meters. All the water is from rainfall and spring without any pollutant. It is pure just like a big crystal among Baofeng mountain Range. When cruise on the lake, you can hear authentic song from Tujia minority people. You can fully understand the harmony and peace between human beings and nature. Visit LEE Junsheng Sand-rock Painting Research Center. Be transferred to the airport after the tour. 1. The package price is based on two persons sharing one room. If you have odd number of travelers, you have two options: 1. one room will have three persons with an extra bed. 2. Pay single room supplement to have an extra room for the one person. 2. You can extend your stay in Zhangjiajie after the tour finished, we will keep the discount hotel rate for the extended days. Private airport or train station pick-up and drop-off services. Entrance tickets of the attractions, cable cars and Bailong Elevator as listed. Hotel accommodation based on 2 persons sharing one room. Tips for the tour guide. 1. Price may vary according to different seasons or Chinese holidays(eg. National Day Holiday, Spring Festival Holiday and etc.) The price of weekend and holidays may be higher than ordinary days. 2. Children taller than 1.1 meters should be charged full price, children shorter than 1.1 meter should be charged only half of the price. 1. You can book tours online or by phone, inform us your arrival date and your flight(or train) information, then we will send you a confirmation email and pick you up on the arrival day. 2. If you have any questions or change of itinerary, please contact us (call or email) as soon as possible. Service hotline: +86 10 82600428 or 63647269(night). Worstest tour i ever had more..
Enquiry : We fly out from Guangzhou , is it easier to fly to Changsha and you pick us up at the airport there ?